Home (All Topics) → Pets & Animals → Dogs → Is A Crossbreed Dog Right For You? By	George Vinci. Last edited by Marios Alexandrou on October 6, 2018. Not everyone wants to keep a pedigree dog. Many people choose to own a crossbreed or mixed-breed dog instead. There are good reasons for doing so. Most crossbreeds make fine, healthy, affectionate pets. By and large, they are well-balanced, trainable dogs and, if socialized properly as puppies, fit happily into the rough and tumble of family life. They have an average life expectancy of 10-15 years and often avoid many of the health problems that affect their purer bred cousins. The term crossbreed applies to puppies from purebred parents of different breeds or from parents of two mixed but known breeds, as well as to puppies whose ancestry is very mixed or unknown—in other words, mongrels. Though very many crossbreeds result from accidental mat-ings, they can also be deliberately bred. Because crossbreeds are not the product of the inbreeding required to produce a pure pedigree bloodline, they possess a quality that is known as “hybrid vigor.” Outbreeding (breeding from an unrestricted gene pool) ensures that genetic characteristics are drawn from many strains of dog. As a result, crossbreeds tend to be tougher, more robust, and more resistant to disease than most pedigree animals, and their chances of avoiding inherited defects and diseases are therefore much higher. For many, the delight of taking a crossbred or mixed puppy into the family is the mystery of not knowing quite how it will turn out. Will it have long or short hair? Will it alter in color as it grows older? Will it stay small, or will it grow to catch up with the size of its disproportionately large feet? A good clue to a crossbreed's ancestry is whether it seems to have some of the looks of a particular breed. Crossbreeds can be acquired from many different sources. Very often they will be given away by a friend or neighbor whose female dog has mated inadvertently with an unknown male and produced a litter of mixed, often very appealing pups. If possible, try to meet the mother before accepting the puppy as this will enable you to find out about the puppy's ancestry, especially if the father is known to the owner. Take the opportunity to observe the mother's behavior toward her puppies, as this should offer a clue to the way your puppy's temperament and character is likely to develop as it grows up. Many crossbreeds come from animal shelters and dog pounds. Veterinary hospitals often keep lists of puppies and adult dogs that need new homes. Try to check the dog's previous history as thoroughly as you can before acquiring a pet this way. If you are choosing a puppy, ask the staff for any information they may have about its background. Was it born in the shelter or did it come in with its mother? Does it have brothers and sisters? Everything you are able to discover about the puppy will help you build up a picture of its character and future development. 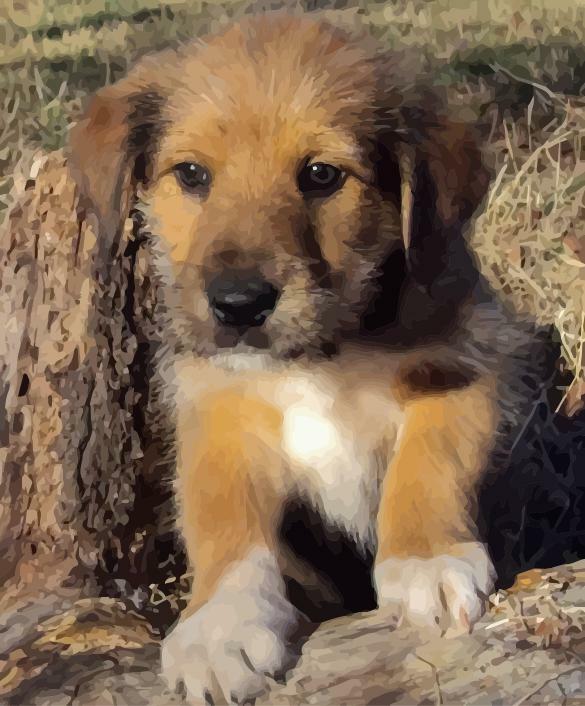 But though your puppy's temperament will to some degree have been forged by its ancestry, the way it is handled and trained in the first few months of life will be at least as, if not more, important in determining its adult character and behavior. This rule applies to crossbreeds just as much as it does to pedigree dogs. I am a 70-year-old widow and have just lost my faithful canine companion of many years. I am still fit and really miss having a pet. Would you advise me to take on another dog at my age? Having another dog is often the best way to recover from the loss of a previous pet.You may find a puppy too much for you, but why not see if your local animal shelter has a calm, friendly, middle-aged crossbreed that will welcome all the affection you can give it? We want to acquire a family dog for our kids who are 8 and 10. We can't afford the high fees charged by pedigree breeders and have been considering a small crossbreed. What do you think? Go ahead-crossbreeds often make the best family pets. Try to find a puppy that is between 8 and 12 weeks old. That way, you can be sure of educating it yourself and ensuring that it has proper temperament and obedience training. I like the idea of adopting a crossbreed from a shelter, but am worried that it may have behavior problems. Is this so? Behavioral problems tend to arise quite frequently in rescued dogs because of their early history of mistreatment and abandonment and because they have spent much of their lives in shelters. However, crossbreeds are likely to have fewer inherited problems than purebred dogs, and if you choose a puppy, a should be well.